Meerschaum, also known by its technical name sepiolite, is a hydrous magnesium silicate formed from the shells and bones of prehistoric sea creatures. Meerschaum originates in Turkey, and can vary in colour from white to light grey or even yellow. It is very porous and light, ranked as a 2 in hardness on the Mohs scale. Meerschaum is mainly found in veins mined as deep as 400 feet below the surface but it can also naturally occur as lumps that look similar to sea foam floating atop the surface of the Black Sea. Mainly used to create pipes, the first pipe recorded using meerschaum was created in 1723 by a shoemaker in Budapest. He discovered that meerschaum is highly absorbent and he repeatedly dosed it in water to make it more pliable while carving. The experiment proved successful, and the first meerschaum pipe was created. Currently, it is housed at the Hungarian National Museum in Budapest. Although meerschaum has been used since the 1700’s, its big break came around the 1840’s when upper class smokers throughout Europe began to collect the white pipes. Europeans were enamoured by the way meerschaum darkened in colour with use which created a booming industry of many European workshops working with high quality meerschaum supplied from Turkey or lesser quality meerschaum from Tanzania, Greece, Spain, and the United States. In the United States, President James Garfield, an avid devotee of meerschaum pipes, commissioned the William Demuth Company from Manhattan to create two pipes for the 1881 inauguration, one in the likeness of the future president and one of his wife. 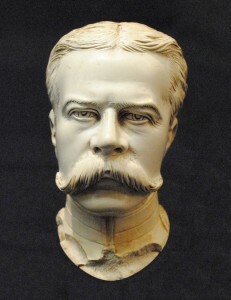 These pipes were received with such high enthusiasm by both the president and upper class society smokers that Demuth decided to commission a series of high relief meerschaum pipes of all 29 presidents.Teddy Roosevelt was known to have over 10 variations of his image featured on meerschaum pipes. We know that the presidential pipe in our collection is not one commissioned by the Demuth Company since it does not have the WDC mark. Other manufacturing companies in the United States found their own carvers to create Presidential pipes which produced multiple sculptural styles of each president. MOA’s pipe is carved in high relief and was likely commissioned by an American manufacturing company at the time. Meerschaum declined in the early 1900’s with the rise of briar pipes. 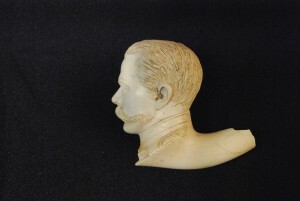 Although meerschaum didn’t fall out of use completely (it was used to line briar wood pipes), it declined in production, which lead to most European workshops closing and the quality of meerschaum reducing, with knock offs created using glue and meerschaum powder. Fun Fact: A major plot device in the movie National Treasure was a meerschaum pipe. Just thought that you’d like to know. Have a Theodore Roosevelt cheroot smoker with amber stem circa 1905-10. Would you be interested in seeing it? It is unsmoked. It has shamrock markings on the underside. Would value your opinion. Chad: I do not often access this website, and I just read your email today. Let’s see it and maybe I can tell you something about it that you do not already know.